HERMA UK have recently supplied a bespoke labelling system to Life Technologies, a global biotechnology tools company that provide an extensive range of products and services to support laboratory operations. In reviewing operations at Life Technologies, labels had been applied manually to plastic cartridges with no guarantee of accuracy or repeatability. Unfortunately this did not achieve the end customer’s desired results and a resolution was sought and HERMA was contacted. Working closely with Life Technologies, HERMA undertook trials using the customers’ product to develop a bespoke system to repeatedly apply 10 x 14 mm labels to within an accuracy of 0.5mm and in doing so, also improved upon both line efficiencies and processes. 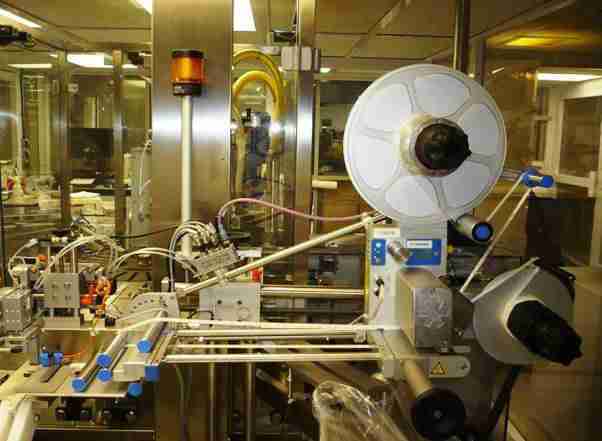 The patented HERMA moving beak system, as shown in the photograph, accurately dispenses a label on to a vacuum pad to within 0.5mm before a pneumatic telescopic arm transfers the label onto the product. Life Technologies Engineering Manager David Myles reported, “The challenge to fit a labelling system within our restricted manufacturing space, along with dispensing a small label to such a tight tolerance was one which HERMA approached with enthusiasm. The specified system well exceeded our expectation and we are very pleased with the end result”.